Tue-Fri 9 a.m. to 9 p.m.
Summer camp registration starts March 17, but eager campers can get a head start by coming to Movie Night on Saturday, March 10, at Upper Noe, from 6 to 9 p.m. The featured film is the original version of “The Parent Trap,” which starts its story at summer camp. In keeping with the theme, Upper Noe staff will be on hand to answer questions as parents and children browse catalogs and fliers. 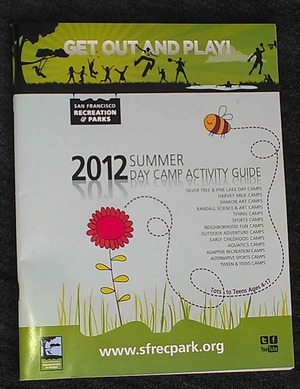 “We can help find which camp is right for them,” said Facility Coordinator Cheryl Woltjen. This summer Upper Noe will host the Recreation and Parks Department’s popular Pacific Art Camp, which runs for four two-week sessions of dance, theater, art and music. You can also see a complete catalog of camps at www.sfreconline.com. Registration begins at 10 a.m. on Saturday, March 17, either online or in person at Upper Noe and other recreation centers. Movie Night will start with live music from local dad-band The Funicellos and cartoons. The evening is hosted by Friends of Noe Valley Recreation Center. As with the tot concerts, donations are encouraged. March’s tot concert itself will be moved to March 17 to accommodate the arrangements that need to be made for the film. 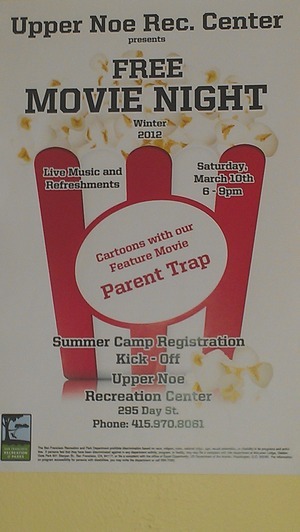 Volunteers are still needed for Movie Night Saturday, March 10. The first shift will help set up between 5 and 6 p.m., and the second group will help clean up between 9 and 10 p.m.
“Maybe this is the low-key opportunity you’ve been looking for to get more involved in our community,” said Karen Spira, who helped organize the event. This event was organized by CRC members Allison Muir, Richard Hildreth, and Karen Spira with the help and cooperation of Upper Noe’s Levy Johnson and Cheryl Woltjen. Email info (at) noevalleyreccenter.com to help. Summer camp will occupy the auditorium—a popular indoor option for tots during the year—but the under-five crowd will have some options at Upper Noe this summer, too, said Cheryl Woltjen, Facility Coordinator for Upper Noe Recreation Center. “We know that’s a void we wanted to fill,” she said. There will be an outdoor class every day, mostly in the mornings. On Mondays, Wednesdays and Fridays, expect to see outdoor “alternative” recreation, meaning anything that is not sports, she said. On Tuesday and Thursdays the center plans to offer “Express It,” an outdoor arts and crafts class for children up to three years old. On Wednesdays younger children can take Karate in the morning or make a mess in the kitchen with Petite Bakers in the afternoons. Woltjen cautioned that all summer programming (besides summer camps) is tentative until mid-March, but she will have a better handle on what’s to come when she talks to parents March 10. 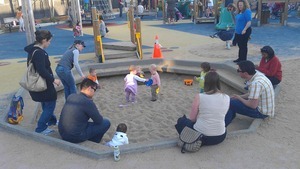 Upper Noe’s sandbox finally has a cover, thanks to Karen Spira, a member of the center’s Community Recreation Council. For the past year, the community has been searching for a solution to the on-going problem of cats using the sandbox as a litter box at night. Spira and others on the council discussed many possible solutions—chicken wire, something made by a local tailor, a call to neighborhood engineers for ideas. Spira took-on the problem and found a good match for the project. A web search yielded Custom Sandbox Covers, whose parent company has supplied marine canvas to businesses and government agencies for more than 30 years. The sandbox covers are made of the same high-grade, water permeable canvas used on U.S. Navy vessels. A chain sewn into the cover’s hem allows it to fit over a sandbox much like a fitted sheet covers a mattress. The chain will be padlocked to a metal loop to prevent theft of the $1,800 cover. The Friends of Noe Valley Recreation Center will pay for the cover and the lock. “The tradeoff is that there’s going to be sandbox hours,” Spira said. The cover will be put on every evening when the site’s manager leaves. There is no staff on site Sundays and Mondays, so the sandbox will not be open on those days. The Friends will also buy signs to explain the closure to parents as well as a box to store the canvas during the day. Spira is hopeful the cover will be ready within two months, she said. The sandbox dilemma is what spurred Spira to join the Community Recreation Council, which is composed of local residents and Recreation and Parks department staff. Its role is to determine programming and events at Upper Noe, among other tasks. “To take action on something that’s been bothering me since my son was born has been really gratifying,” said Spira, who has been coming to the park with her husband since they moved around the corner about five years ago. She hopes the site’s CRC will grow to include a wide variety of people, and she encourages park users to contact Facility Coordinator Cheryl Woltjen to join the group. 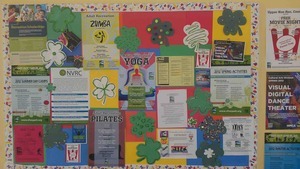 To learn more, visit http://www.noevalleyreccenter.com/get-involved/recreation-council-application or call the center at 415-970-8061. There are two important but distinct volunteer organization that support and advocate for Upper Noe: the Community Recreation Council and the Friends of Noe Valley Recreation Center. The Community Recreation Council is part of the Recreation and Parks Department’s new organization model, implemented a year and a half ago. Each recreation center has a CRC composed of seven members (including, ideally, one teen member) who meet monthly to discuss programming, safety issues, events and other park matters. Staff members help lead discussions and liaison between the community and the San Francisco Recreation and Parks Department. The Friends group was established during the renovation of the park in 2008. Thanks to fiscal sponsorship through the San Francisco Parks Alliance, Friends can raise money for equipment, events, supplies and other park related projects. The Friends group can sponsor events, supplies, and projects that the CRC organizes or deems necessary for the park. We have purchased many items for Upper Noe including AV equipment used for tot concerts, toys, art supplies, athletic equipment, and gardening projects. The Friends sponsor this newsletter, the free monthly tot concerts, the holiday music concert, and the Noe Valley Elementary School fair. Together these two organizations give voice to Upper Noe’s community and facility needs. If you enjoy the free events at Upper Noe, please consider giving a donation to the Friends group, join one of the organizations, or volunteer to help out at one of the events. By turns solemn and lively, the Tumbleweed Wanderers will rock and roll with the tots Saturday, March 17, from 9 to 11 a.m. in the Upper Noe Recreation Center auditorium. 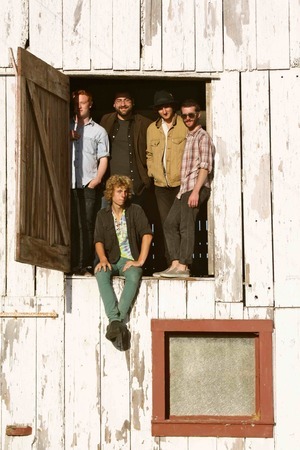 TW is not a traditional kid band, but experience at the Noe Valley Farmer’s Market has shown them that children like their songs, said Jeremy Lyon, who started the band with Zak Mandel-Romann about a year ago. The group grew from local roots: Mandel-Romann and Lyon formed an earlier band at Lick Wilmerding High School in San Francisco. “We spent a lot of time in Noe Valley at Happy Doughnuts, Dolores Park and cafes,” he said. Lyon met Rob Fidel (vocals, banjo and guitar) at an open mic night in Santa Cruz; he met drummer Daniel Blum during an internship at a recording studio; and Mandel-Romann met keyboardist Patrick Glynn at band camp when both were young. In the past year Tumbleweed Wanderers have played clubs, cafes, house parties and street shows. They recently finished a whirlwind two-week tour of the Southwest that included stops in California, Arizona and Colorado. On March 9, they will release their first acoustic extended play album at Bottom of the Hill. This is the group’s first dedicated kid show, and Lyon expects they will focus on familiar cover songs from groups like The Beatles and bluegrass legend Bill Monroe, as well as their own material. They plan to bring a salad of acoustic instruments, including guitar, upright bass, mandolin, banjo, harmonica and a trashcan drumset. • Serve as a greeter for the free concerts. The Friends of Noe Valley Rec Center need a “friend” to help us greet families during our monthly free concert. Let them know about our mailing list and introduce them to our small group. Our greeters hand out flyers and accept donations for the concert series. The next opportunity will be March 17 from 10 a.m. to noon. Even volunteering for one hour would make a big difference! • Lead a new event. Are you interested in organizing a new event at the Center? Maybe a game night or movie night? We are also looking for someone who could add a creative addition to the park. We have limited space, but we’d love to see a new activity area or artistic display. Please email suggestions to info (at) noevalleyreccenter.com. Grab popcorn, learn about summer camps and watch the original Parent Trap. A week’s worth of literary events. Please see the Friends of Noe Valley‘s website to learn more.